Last week, I made a business trip to the US for a training session. There are direct flights from South Africa, but in this case, the timing of these flights was such that I would have ended up back in South Africa after the last flight to East London would have left. With other words, I would have been stuck for a night at Johannesburg, which was not a very nice prospect. I therefore opted to fly over London and make a sidetrip to Belgium for a couple of days, visiting family and friends. The trip was long, covering 4 countries in 10 days. The first night I flew to London and then from there to Belgium. You find some of the pictures of people and places I visited in Belgium in the gallery. On Saturday, I flew back to London and from there to the US. Sunday was my birthday AND Easter, so a good occasion for doing something special. I went into New York and went to the Easter Parade. At this parade, people wear fancy hats, anything from a nice sunday hat to extreme hats made from real plants. Have a look at the pictures and see! 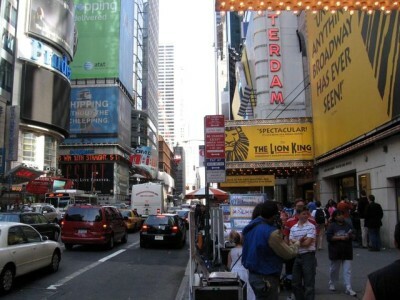 In the afternoon, I saw the Lion King show on broadway. The show was great: the music was wonderful, the costumes innovative and fascinating and the whole experience amazing. Highly recommended, although very expensive ($120 per seat!). After the show, I visited central park, which was also a wonderful experience as the weather was fantastic. The following Wednesday, I flew back to the UK (overnight), visited the UK office (during the day) and then flew on to South Africa (overnight). What a trip … You can have a look at the pictures by clicking here or on the picture on top.